Here are three of our favorite pics of Zar. 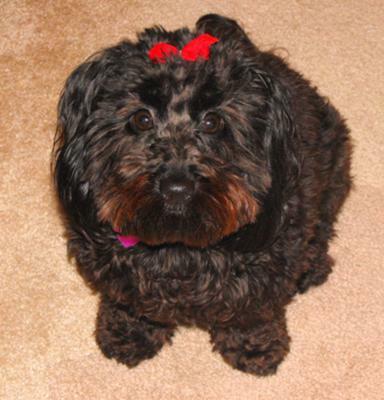 Zartan, our black Mauxie, was born on Feb. 23, 2007 and came to our family in May of 2007. We got him from a woman in Shoreline. He is the best edition to our family ever. With a loving personality, he never wants to leave mom and dad's side. He loves playing chase and wrestling. He is so talented with balance that he sits on his tush straight up for minutes on end. Zartan loves playing with other dogs and is friendly with everyone. We'd love to socialize him with other Mauxies in the area. If you live in WA please contact us!! Zartan, are you a cute bundle of curls or what? We are 2 Maltese dogs and if we lived in Washington we'd be knocking on your door, but we live in Texas. However, we send you doggie kisses from the Lone Star State and we know all the girls will be after you there! Oh and we love your name! Return to Tell Us About Your Mauxie!. 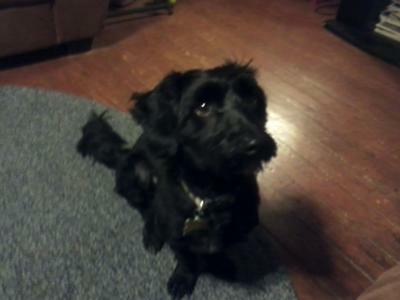 He is a black Mauxie with a patch of white on his chest. Very loving and silly, loves to be outside and run for hours. Likes to be held and just lay on you, full of personality. Has a habit of chewing everything in sight... hope that goes away soon, lol. Greatest Mauxie dog ever!!!!! My Sashi is the splitting image if your Max, she is playful loving, always at my feet. I with I could add a photo. Two Paws UP! for Max! This is a update about my sweet boy Elliott. 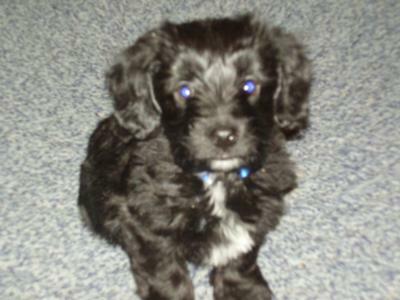 I got my male Maltese Dachshund for Christmas last year 2010. In November he turned 1yr old. It has been a wonderful pleasure since he came into our lives. He is the most playful little dog I have ever seen. He is so smart, I call him little Einstein. Most of the tricks he knows he basically thought himself. He loves to shake hands. My Maltese Doxie mix is a real snuggle bunny. He runs around our house at break neck speed, when he wants to play. He loves to walk, bark, and run after anything blowing in the wind. He loves all people big and small. He even likes to watch tv. He always wags his tail and lays on his little belly with his back legs stretched out behind him. I get his hair cut during the summer because his hair is so long like a Maltese and so soft. He always sports a very short cut in summer. Letting it grow out now looks like a total different dog. Mauxies are the best dogs ever. They truely bring zest into your life. Mine has. I love him very much. 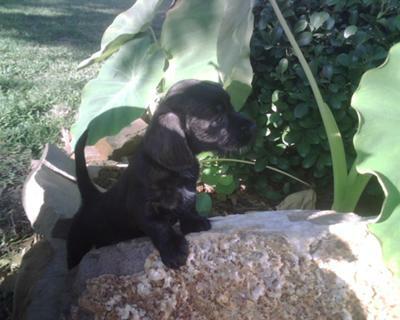 I got a Dachshund Maltese dog for Christmas, truly a beautiful puppy. He is a big clown. Very smart, but very strong willed. He is so smart and acts just like a dachshund. I have never had a Maltese but Elliott have a body like a Dachshund and a cute face like a Maltese. A very sweet puppy, he is king in this household already. As you can see he is my pride and joy. 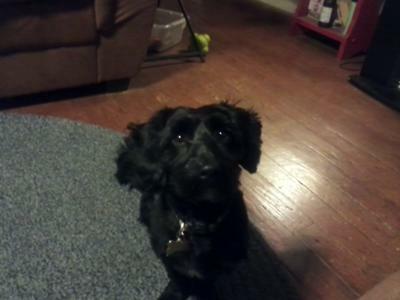 Jasmine is a 2 year old black Mauxie. She is the first dog we have ever owned and love her more than you can imagine. She is ornery, very loving and playful she loves to cuddle up with you when you lay down. She just loves people. She is overall a very good girl. We are so happy that we were the ones who got her!